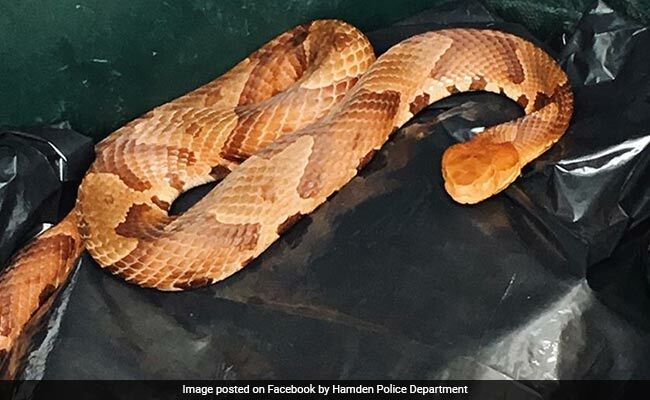 Hamden Police Department has shared a picture of the snake on Facebook. A man in Connecticut, US, was hoping to do a good deed but ended up getting a huge, scary surprise instead. A post shared on Facebook by Hamden Police Department details how the man noticed a garbage bag in a park and decided to pick it up and throw it in a bin at home. He, however, made a shocking discovery the next day when he found a venomous copperhead snake in the bin. According to the post, the man, who frequently visits West Rock Ridge State Park, had found the garbage bag in the park area. He had picked it up and put it in his vehicle to dispose of it at his residence. Upon finding the snake in his bin the next day, he called for help. Assistant Animal Control Officer Mitch Gibbs consulted the Department of Energy and Environmental Protection and eventually took the snake back to the park. "Maybe we should stay away from parks," says one Facebook user. "Yikes!" says another. "Beautiful snakes... absolute perfect camouflage... they pack a punch but would rather get away from us than bite us," says another. Earlier this week, a rare two-headed baby copperhead snake was found in Virginia.